There are so many manifestations of the name ‘Hafiz’ in the universe that a person looking out from the window of reflection (tafakkur) can easily see the manifestations of this name of Allah’s on any living or non-living thing. As a person observes the names of beauty,‘Jamil and Jamal’, while looking at a very beautiful flower, he must also observe on it the name ‘Hafiz’ that is the source and the secret of how the beauty of this flower is preserved. Likewise, along with the name of majesty, ‘Jalal’, that is manifested upon a mountain, the name ‘Hafiz’ may also be clearly observed. Indeed, had there not been the manifestations of the name ‘Hafiz’ in the universe, weak and ajiz (powerless) non-living creatures would not have been preserved, and living creatures would not have been able to lead their lives. This is because, along with all the other names, but especially with the manifestation of the name ‘Hafiz’, the balance of the universe and all the needs required for life are provided until the predetermined time (ajal) comes, and all the activities that man has undertaken and all his deeds are recorded and saved to be used at a specific time. Just as people record the sweet moments they experience in the world in order to watch them and taste that same happiness again and again, insha’Allah the people of Jannah will also taste happiness when watching the sweet moments of their lives in the world that have been recorded by the manifestations of the name ‘Hafiz’, and also they will feel relieved that the hard and sorrowful days of their worldly lives are behind them. Ya Hafiz! 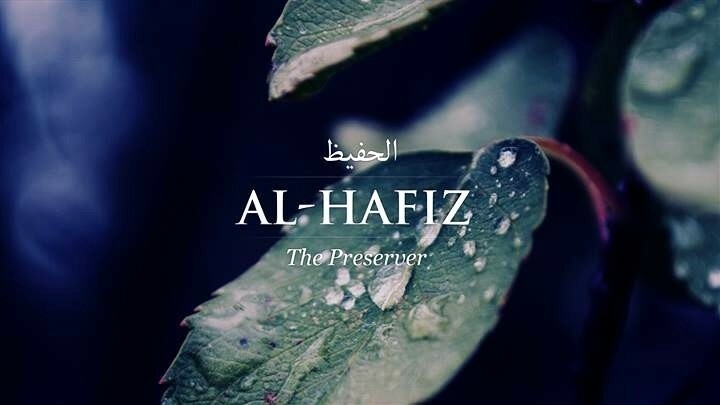 Preserve and protect us from the evils of jinn and humans, and help us in this world and in the akhirah (hereafter) with your beautiful name ‘Hafiz’. And make our feet steadfast in this religion. Amin. Amin Ya Mu’in.